Tender, juicy, whole garbanzos. Fully cooked to perfection for a soft, creamy and yet slightly crunchy taste. Our 29 ounce can of garbanzos is a family delight. Ready to eat from the can or you can simply convert a "regular" salad into a "great" salad by adding our garbanzos. Display this product and your customers will thank you for giving them the very best. 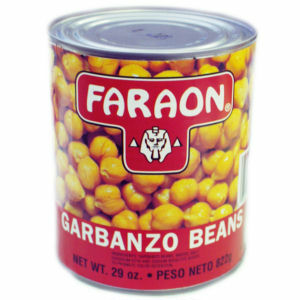 Faraon garbanzos have been selected by renowned San Francisco chefs in a blind taste test as the No. One Best tasting garbanzo!